"Ultrasound imaging, also called ultrasound scanning or sonography, involves exposing part of the body to high-frequency sound waves to produce pictures of the inside of the body. Ultrasound examinations do not use ionizing radiation (as used in x-rays). Because ultrasound images are captured in real-time, they can show the structure and movement of the body's internal organs, as well as blood flowing through blood vessels." "Ultrasound imaging is a noninvasive medical test that helps physicians diagnose and treat medical conditions. An ultrasound of the body's two carotid arteries, which are located on each side of the neck and carry blood from the heart to the brain, provides detailed pictures of these blood vessels and information about the blood flowing through them. 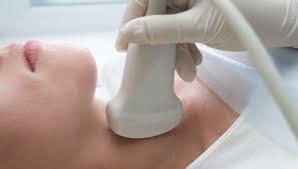 A Doppler ultrasound study is usually an integral part of a carotid ultrasound examination. Doppler ultrasound is a special ultrasound technique that evaluates blood flow through a blood vessel, including the body's major arteries and veins in the abdomen, arms, legs and neck." 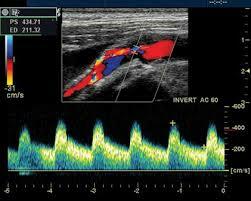 "Calling for a carotid ultrasound are:DiabetesElevated blood cholesterolA family history of stroke or heart diseaseA carotid ultrasound is also performed to:Locate a hematoma, a collection of clotted blood that may slow and eventually stop blood flow. Check the state of the carotid artery after surgery to restore normal blood flow.Verify the position of a metal stent placed to maintain carotid blood flow." "Carotid ultrasound may be difficult or impossible if a patient has a dressing covering a wound or surgical scar in the neck. An occasional patient is difficult to examine because of the size or contour of the neck. Calcium deposits in the wall of the carotid artery may make it difficult to evaluate the vessel. A small amount of soft plaque that produces low-level echoes may go undetected. For a more complete assessment, patients may need to undergo a CT or MRI of the carotid arteries." "Ultrasound imaging, also called ultrasound scanning or sonography, involves exposing part of the body to high-frequency sound waves to produce pictures of the inside of the body. Ultrasound examinations do not use ionizing radiation (as used in x-rays). Because ultrasound images are captured in real-time, they can show the structure and movement of the body's internal organs, as well as blood flowing through blood vessels. Ultrasound imaging is a noninvasive medical test that helps physicians diagnose and treat medical conditions. 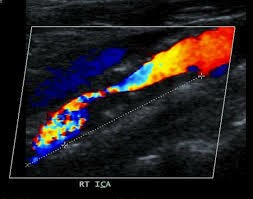 Venous ultrasound provides pictures of the veins throughout the body." 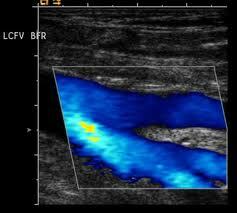 "A Doppler ultrasound study may be part of a venous ultrasound examination. Doppler ultrasound is a special ultrasound technique that evaluates blood flow through a blood vessel, including the body's major arteries and veins in the abdomen, arms, legs and neck." " Veins lying deep beneath the skin, especially small veins in the calf, may be hard to see. " "Ultrasound imaging, also called ultrasound scanning or sonography, involves the use of a small transducer (probe) and ultrasound gel to expose the body to high-frequency sound waves. Ultrasound is safe and painless, and produces pictures of the inside of the body using sound waves. Ultrasound examinations do not use ionizing radiation (as used in x-rays)." " Because ultrasound images are captured in real-time, they can show the structure and movement of the body's internal organs, as well as blood flowing through blood vessels. Ultrasound imaging is a noninvasive medical test that helps physicians diagnose and treat medical conditions. 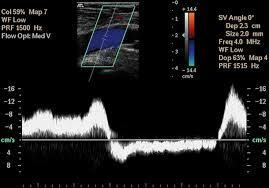 Vascular ultrasound provides pictures of the body's veins and arteries. 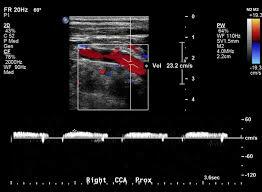 A Doppler ultrasound study is usually part of a vascular ultrasound examination." "Vessels deep in the body are harder to see than superficial vessels. Specialized equipment or other tests such as CT or MRI may be necessary to properly visualize them. Smaller vessels are more difficult to image and evaluate than larger vessels. 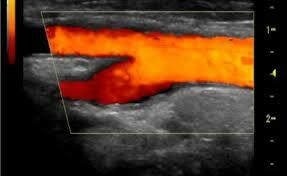 Calcifications that occur as a result of atherosclerosis may obstruct the ultrasound beam." " Sometimes ultrasound cannot differentiate between a blood vessel that is obstructed versus one that is slightly obstructed. Even if there is a very small remaining opening, the weak blood flow produces a sometimes undetectable signal. The test is specialized and is best performed by a technologist and physician with experience and interest in vascular ultrasound imaging."